The holiday season is in full swing and so is the North Carolina “Booze It & Lose It” Campaign, created by State Transportation Secretary Gene Conti in an effort to remove impaired drivers from the road and keep our citizens safe. Checkpoints and increased patrol began on December 6th and will continue through January 2, 2013, to help reduce the rising number of alcohol related crashes, injuries and fatalities state wide. N.C.G.S. § 20-138.1. Impaired driving. Last year, 3,600 North Carolina Drivers were charged with DUI / DWI during the month long holiday campaign and that number is expected to increase this year. Not only does drinking and driving put you at risk of getting arrested at a checkpoint or during a traffic stop, it puts your life and the lives of others in danger. In fact, drunk drivers with a blood alcohol concentration (BAC) of 0.08, the legal limit, are 11 times more likely than a sober driver to be in a motor vehicle accident. This likelihood increases with the increase of the BAC level. With odds like that, why risk it? In 2011, there were more than 950 alcohol related crashes in North Carolina during the “Booze It & Lose It” Campaign spanning from December 3rd – January 3rd. Those 950 crashes resulted in 44 fatalities and 702 injuries- some of which were innocent victims and not the drunk driver themselves. If you find yourself questioning weather you had too much eggnog at your office holiday party, don’t risk getting arrested or worse, endangering your life or the lives of others. 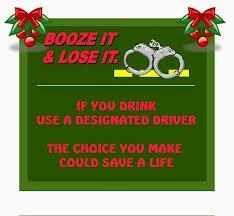 Play it safe and call a cab or have a sober friend take you home. If you or someone you know have any legal needs this holiday season call Collins Law Firm at (910) 793- 9000 (910) 793- 9000. Over the past twenty years, cell phones have become an essential part of day to day life for many Americans. Cell phones continue to provide us with the convenience to communicate while on the go, comfort in knowing we have a way to call for help in case of an emergency, and access to music, games and entertainment. Cell phones can make life easier, but when used irresponsibly, can have disastrous consequences. Answering a text takes away your attention for about five second. That is enough time to travel the length of a football field. We know it is dangerous, but many of us continue to send or receive text messages while driving thinking that nothing will happen to them. But according to the National Highway Traffic Safety Administration, text messaging while driving makes a car crash 23 times more likely and 1.3 million auto collisions involved cell phones last year. Unfortunately, about 6,000 deaths and about 500,000 injuries are caused by distracted drivers every year. In response to the rapid increase in texting while driving fatalities, 39 states, including North Carolina have passed laws prohibiting all drivers from texting while driving. 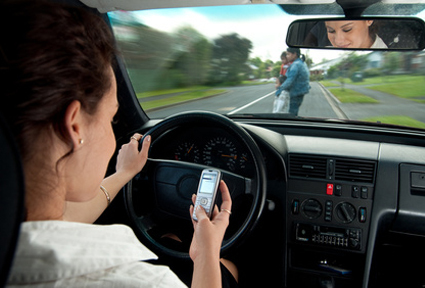 Texting while driving is a violation of the North Carolina General Statute §20-137.4A. (2) Read any electronic mail or text message transmitted to the device or stored within the device, provided that this prohibition shall not apply to any name or number stored in the device nor to any caller identification information. (1) The operator of a vehicle that is lawfully parked or stopped. (2) Any of the following while in the performance of their official duties: a law enforcement officer; a member of a fire department; or the operator of a public or private ambulance. (3) The use of factory-installed or aftermarket global positioning systems (GPS) or wireless communications devices used to transmit or receive data as part of a digital dispatch system. (4) The use of voice operated technology. (c) Penalty. – A violation of this section while operating a school bus, as defined in G.S. 20-137.4(a)(4), shall be a Class 2 misdemeanor and shall be punishable by a fine of not less than one hundred dollars ($100.00). Any other violation of this section shall be an infraction and shall be punishable by a fine of one hundred dollars ($100.00) and the costs of court. A texting while driving charge will not cause you to receive any drivers license points or insurance surcharges, however the charge will appear on your North Carolina DMV record unless you are able to have the charge dismissed. If you or someone you know has received a ticket for texting while driving, call Collins Law Firm for a free consultation at 910-793-9000 910-793-9000.